“A Question of Hu,” one of Hung Liu’s earliest and most private paintings, represents a complex interplay of nostalgia for the artist’s homeland and critical awareness of her liminal status as both an émigré from China and an immigrant to America. 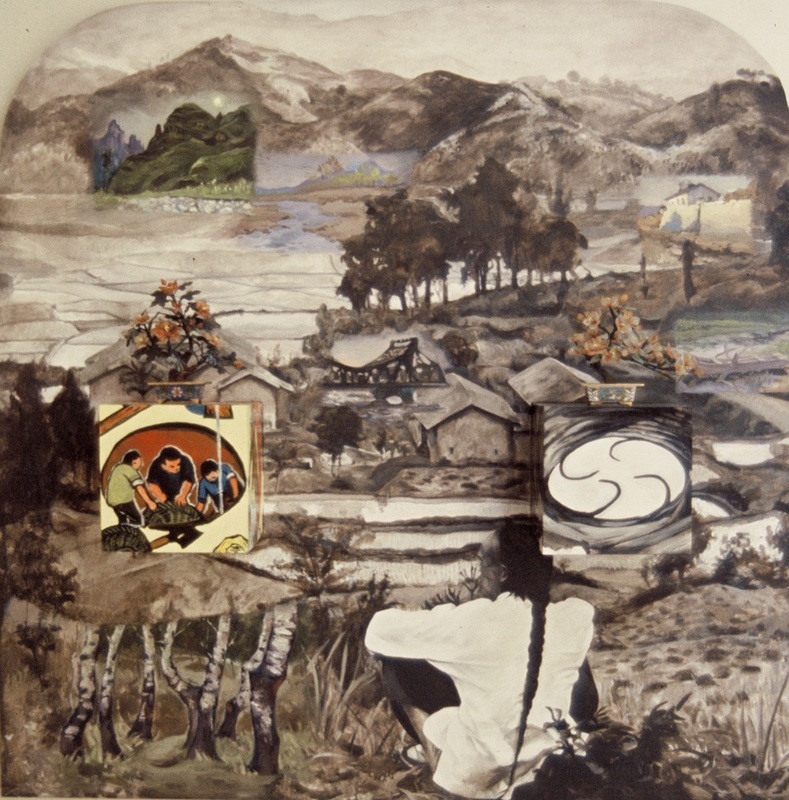 Titled after a book by the renowned China scholar from Yale, Jonathan Spence, “A Question of Hu” is an arch-shaped canvas – about five feet high – depicting a rural Chinese landscape with a man sitting in the foreground with his back to the viewer, his hair braided in a traditional queue, gazing upon the scene as if looking into the past. What seems at first a single, coherent (if generic) landscape soon opens into a heterogeneous patchwork of miniature landscapes: a river flowing through a barren winter landscape, a close-up cluster of gnarled tree trunks, the sun-soaked wall of a village swimming pool, an aging railroad trestle crossing a river, looming canyon walls of blue and green with an almost ancient Chinese sun in a perennially hazy sky. Like a peasant blanket, these paintings-within-a-painting cover the view with a layer of personal recognition, since the artist originally painted these small oil paintings (and several hundred others, now mostly lost) furtively in the countryside during the Cultural Revolution, when any expression of art sans ideology was grounds for public criticism (which the artist in fact endured). Now collectively titled her “Secret Freedom” paintings, these diminutive one- or two-a-day paintings were small enough to fit under the artist’s coat in a little painting box which she kept under her bed during the early 1970s for fear of discovery. By re-painting them into the photo-based landscape of “A Question of Hu,” Liu ripens a stereotypical Chinese scene into a field of personal memory. Like the man sitting in the foreground, she is alone looking back through space and time, but the landscapes she now sees she first encountered underfoot and recorded by hand. The fact that Liu re-painted these pictures upon a new canvas in 1991, while living in California, attests to both her longing for home and her critical awareness of images, whether mediated by hand (painting) or by machine (photography). Liu is copying her earlier (and smaller) Chinese paintings on a contemporary (and larger) American canvas, stitching together a kind of pictorial quilt that complicates and challenges the soft-focus nostalgia of the photograph upon which it is based. As a survivor of the Cultural Revolution, during which she worked as a peasant in the countryside, Liu punctures the Orientalism of the overall scene with miniature pictures she has already painted in China, in the countryside, and which, like her, have survived. Hanging like shelves from the canvas at about chest height are two wooden boxes on which the artist has painted five-sided scenes of terraced pits being excavated into the earth. On the left, the box depicts, in a Socialist Realist style, village peasants digging a well during the Cultural Revolution; on the right, we look into the massive pit of a copper mine in Utah (from a photo-montage by the late Robert Smithson). Reversing the pictorial logic of surface-to-depth, these three-dimensional images bore into the ground (like eyes), further puncturing, as do her little paintings, the illusion of landscape space. The overall sense of “A Question of Hu,” then, is that of an altarpiece; indeed, sitting on the boxes, like ritual offerings or miniature landscapes, are two faux-jade imitations of Bonsai (penzai) plants purchased in San Francisco Chinatown, USA.